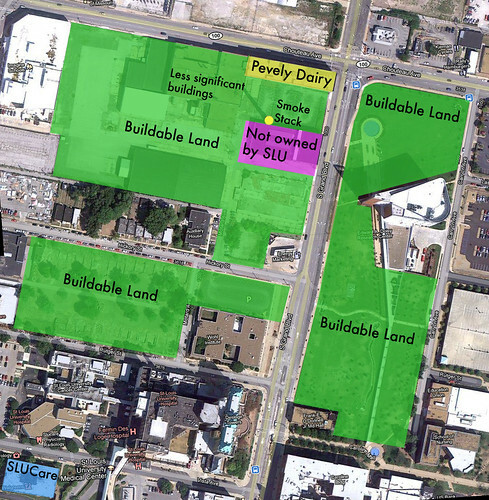 From early November through last Monday evening, the preservation community in St. Louis was focused on saving the landmark Pevely Dairy at Grand and Chouteau. 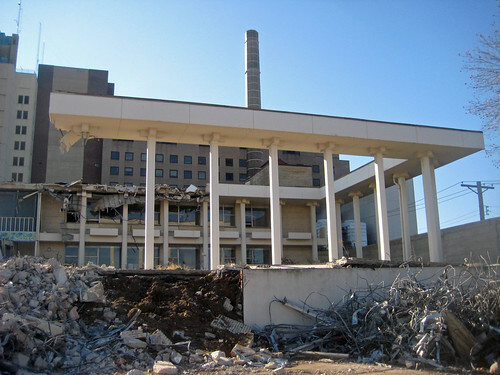 The Preservation Board voted 3-2 for a compromise to prevent SLU from demolishing the most significant portions of the Pevely complex, the corner office building and the smoke stack, while allowing the milk plant and garage buildings to be demolished. 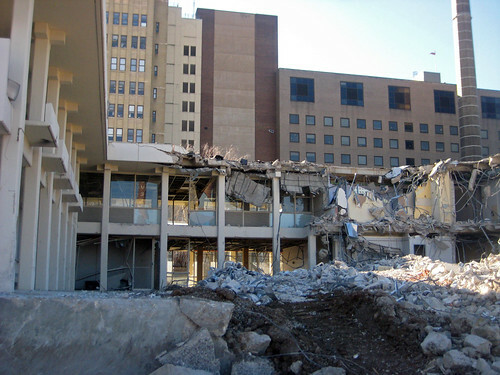 Just down Grand from Pevely however, this week St. Louis University Hospital is process of demolishing a lesser known but equally significant structure, the David P. Wohl Sr. Mental Health Institute with little to no outcry. 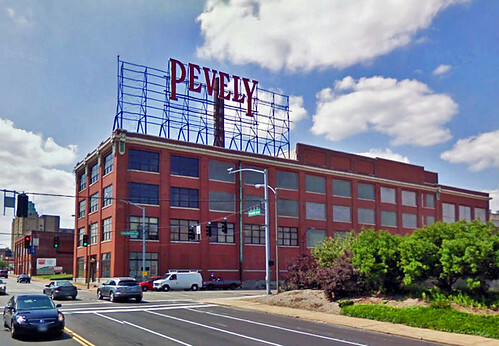 During his testimony at the Pevely Preservation Board hearing Steve Smith, principal of the Lawrence Group stated that the Pevely Dairy was not designed by a prominent architect and cannot be found in any books about St. Louis architecture. This is true, but this same argument could be said about several buildings near SLU's main campus that have been renovated with historic tax credits in the last several years including the former Warehouse of Fixtures building, the Aquinas Institute of Theology, and the Spring Street Lofts. The Wohl Institute however was designed by a very prominent architect, Gyo Obata of HOK, and is featured in the book Modern Architecture in St. Louis. In the book, Obata describes the design of the building as alternative to the asylums where psychiatric patients were locked away from the rest of the world. The facility reflected the most modern and advanced treatment theories expressing openness with several garden courtyards cut into the two story structure. Architectural Record published the design in October 1959, titling the article: "Pleasant and Open Plan for Psychiatric Patients. 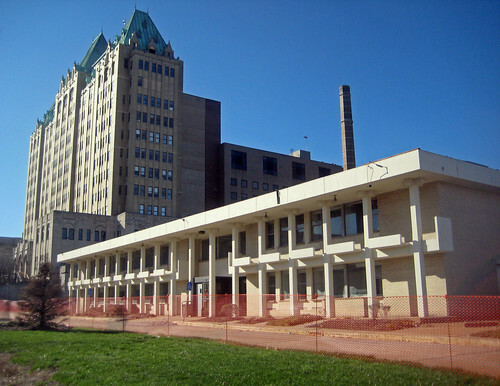 City of St. Louis property records indicate that the building was completed in 1962. The buildings three 2-story wings were designed around landscaped garden courtyards. 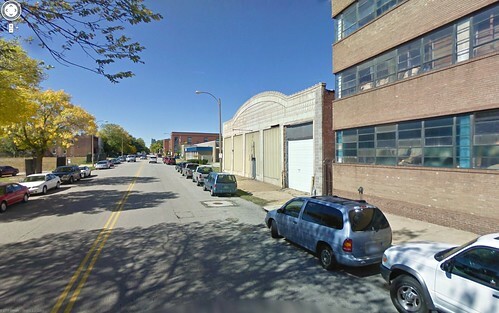 SLU applied for a demolition permit for the building on May 20th, 2011. 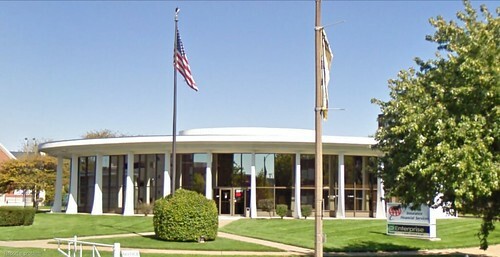 Despite being designed by prominent architect and included in a book of significant modern architecture in St. Louis, the building was not on the National Register, in a historic district, or in a Preservation Review area, so the request to demolish the Wohl Institute was never Reviewed by the Cultural Resources Office nor presented to the Preservation Board. Ironically in July, as SLU was ripping down the small neighborhood of sturdy brick single family homes behind the Wohl Institute, the Preservation Board had a special agenda item regarding a grant for a thematic survey of Modern Movement Architecture in the City from 1040-1975. Had this survey already been completed, the Wohl Institute just may have been given the recognition and potential protection it deserved. I could not find any information information about where the psychiatric treatment services formerly housed at the Wohl Institute have been relocated. 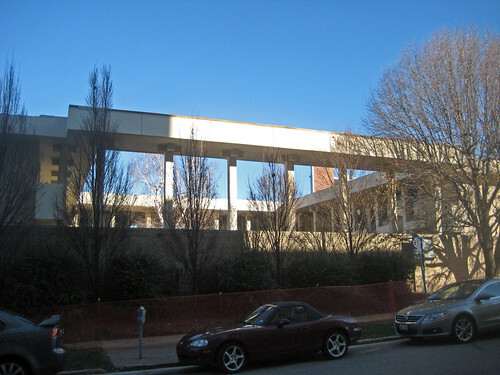 All information on SLU's website still lists the address of the building now undergoing demolition. A site plan presented at the Preservation Board - Pevely meeting shows surface parking lots on the site of the Wohl Institute and the now vacant lots where homes stood on Hickory & Rutger west of Wohl. The lots would presumably serve the new ambulatory care center that SLU is planning to construct on part of the Pevely site. 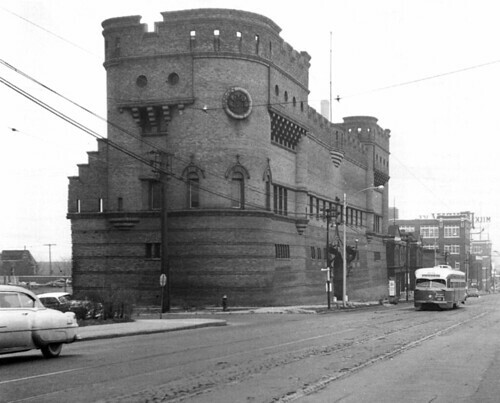 Before the Wohl Institute was constructed, the site on Grand was home to the St. Louis Armory - Battery A - Light Artillery, a massive castle like structure. This photo from the St. Louis University Pius XII Memorial LIbrary Special Collections was taken Christmas week 1959. The Pevely Dairy ice cream plant that was lost to fire in 2009 and the surviving office building with rooftop sign are seen beyond. This photo shows a jagged toothed edge of the brick a the corner of the building along Rutger, which seemed to indicate that part of the building had already been demolished. Most armories typically included a large clear-spanned space that would be used for practicing field drills and holding other events. An 1889 photo from the Missouri History Museum showing the building at its completion however shows the same tooth like brick at the edge of the building. If it was planned to be larger, like the structure eventually built in 1937 on Market Street in the nearby valley, it was apparently never built. The 1909 Sanborn map above also verifies this. If anyone has further info, please share. Last night the Preservation Board voted 3-2 to uphold the Cultural Resources Office staff recommendation to allow demolition of the Pevely milk plant and garage buildings, but to deny demolition of the Pevely Dairy office building at the corner of Grand & Chouteau and the smoke stack. 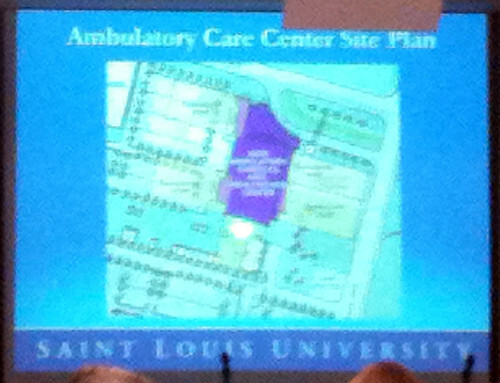 Interestingly enough, the plan for SLU's new ambulatory care center presented by Lawrence Group principal Steve Smith last night should not need to change too much due to the board ruling. The site plan below shows a rectangular green space at the corner with a curved drive leading to the new building (shaded purple). The green space is about the length of the of the corner office building and should only require minor adjustment of the plan, if any. The plan already had incorporated preserving the smoke stack just east of the new building. 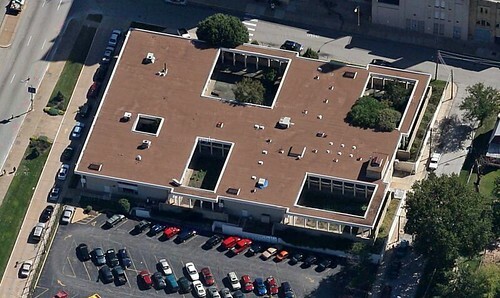 The colored aerial photo below shows the small rectangle of the site occupied by the office building (shown in yellow). The plan above shows future wings (lightly shaded and barely visible) extending east and west from the main building. 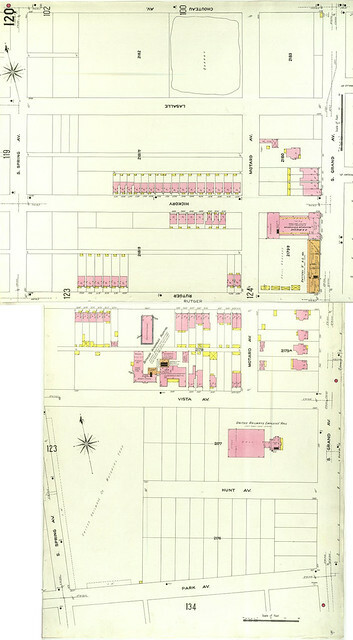 This assumes acquisition and demolition of the building just south of the smoke stack, although the new main building does not appear to conflict with this either. 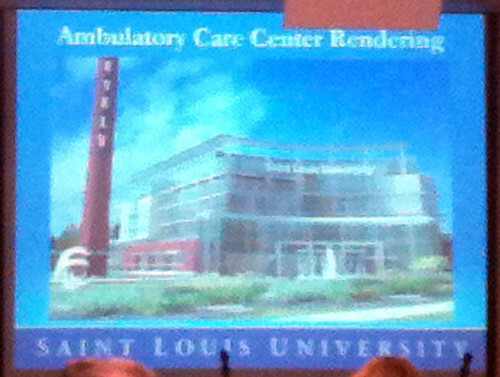 A rendering of the SLU's proposed ambulatory care center with the historic Pevely smoke stack. With last nights ruling, the building will only need to work with the Pevely office building. There seems no reason why the two cannot coexist minus of course a big empty green space and a fountain! The Preservation Board will consider SLU's proposed demolition of the Pevely Dairy complex at a special meeting on Monday, December 19th at 4:00pm. The meeting will take place at 1015 Locust Street, suite 1200. As you may recall, SLU pulled Pevely from the agenda of last months Preservation Board meeting and then issued a statement to the press that their plan to construct a new medical office facility for SLUCare on the site has not changed. A SLU spokesman said that the delay gives them more time to prepare their case for presentation to the board. SLU representatives will no doubt show up with renderings of the new SLUCare facility and present arguments that the Pevely corner is the only location amongst the dozens of acres of vacant land that they own in the immediate vicinity where they can build the new building. After SLU's presentation, the Preservation Board will allow testimony from concerned citizens, so if you are opposed to demolition of this National Register landmark please attend the meeting. 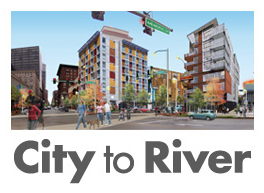 If you cannot attend, please email your statement to Betsy Bradley, Director of the Cultural Resources Office at bradleyb@stlouiscity.com Emailed statements will be entered into the record and used in the final analysis by CRO staff that is presented to the Preservation Board. UPDATE: THE AAA HAS BEEN REMOVED FROM TODAY'S AGENDA! Today at 1:30 in Rm 208 of City Hall there will be a public hearing by the Board of Adjustment on Rezoning the AAA property on Lindell Boulevard so that CVS can build a new store on the site, the plan for which currently includes demolishing the iconic AAA "space ship". The public is invited to speak their opinions at these hearings, so please attend if can. This brings up a host of questions about how and who should be making these kinds of decisions. The problem here is and is not zoning. Changing the property to Zone H is not the issue in what it allows. In my opinion the entire length of Lindell should be zoned to a allow 20 story towers if someone wants to build one. The problem is what Zone H does not prohibit. It would not prohibit a cookie cutter fake stucco CVS box set 75 feet back from the street. This is why we need comprehensive zoning change including form based zoning city-wide. Then there is the issue of landmarking. How is it that our City has a Cultural Resources Office and this building is not protected in any way shape or form? The City is starting the process of taking a leadership role with an Office of Sustainability, which happens to be hosting a public Summit on Sustainability tonight at the History Museum. Part of this new leadership in sustainability needs to involve the built environment including preservation, walkability, TOD, construction standards, etc. Finally, no Alderman should be making these types of decisions. Yet Alderman Kennedy has discouraged Landmarks Association from attending 18th Ward Block Unit public meetings where the future of the AAA building and site are being discussed! Friday morning I saw a photo posted on Facebook of this building on Laclede between Vandeventer and Sarah being demolished. 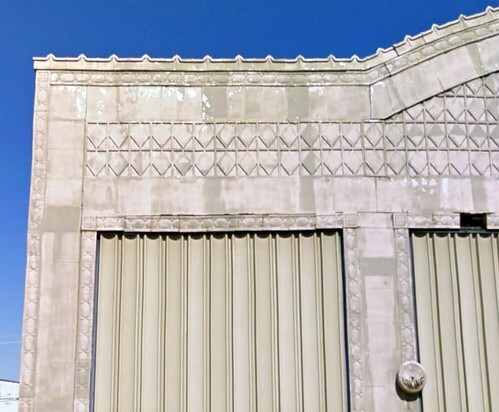 The building had a very attractive terra cotta facade that had been painted. Detail of the terra cotta facade. 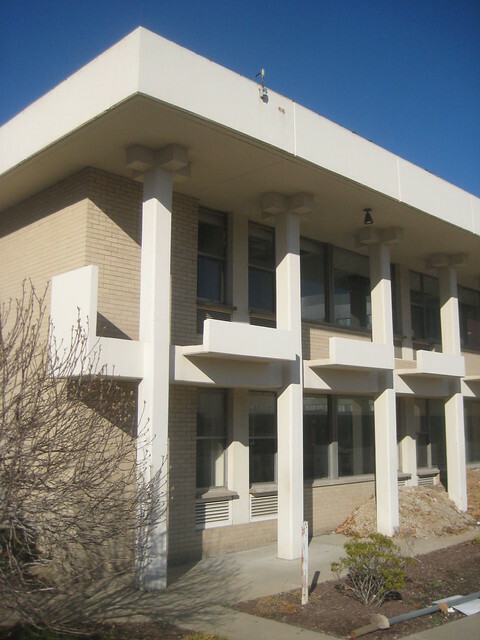 The building is similar to one almost directly across the alley facing West Pine. 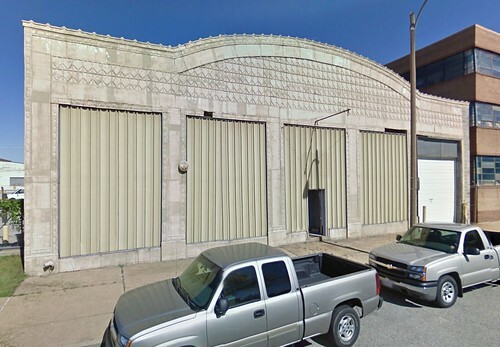 Several photos of that building can be seen on an August post from Seeking St. Louis. Both buildings have terra cotta fronted rectangular elements with bow truss garages behind. My guess is that these were auto dealerships. The building had apparently sustained some wind damage in 2010. 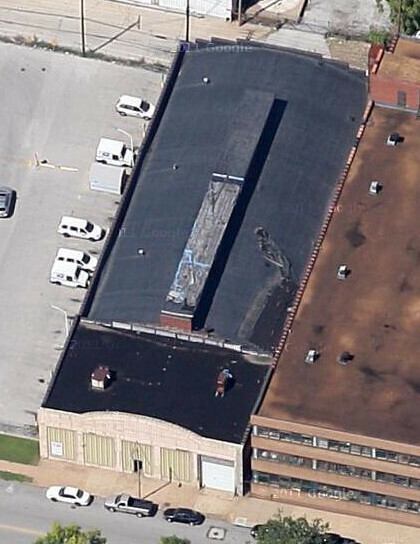 This aerial shows some roofing had been blown off and one column of terra cotta on the facade has been replaced with concrete block in what looks like a recent repair. From the exterior appearance, there is nothing though that would seem to warrant demolition. A Google streetview shows the building in context. In the distance is the 6 North apartments which nicely bookends the block. Across the street is a large vacant lot where the Center for Emerging Technologies hopes to build a new building. Combined with the post office parking lot, now there will be a pretty large hole on the north side of the street.